Apple filed a motion in the San Jose District Court late Friday requesting an additional $707 million in damages and a wider US sales ban covering all of Samsung's infringing devices. The South Korean electronics giant has also filed its own motion requesting a retrial. The US outfit filed with the same court used in the trial between both companies last month. At the time, Apple walked away with $1.045 billion in damages after the jury found Samsung guilty of infringing on Apple's intellectual property, patents and UI. Apple wants another $400 million to cover design infringement, $135 million for "willful infringement" of its utility patents, and $121 million in supplemental damages to cover Samsung's sales while the jury deliberated on their verdict last month. The company also requested $50 million for prejudgment interest in damages through December 31. In addition to extra compensation, Apple wants an injunction to cover "any of the infringing products or any other product with a feature or features not more than colorably different from any of the infringing feature or features in any of the Infringing Products." 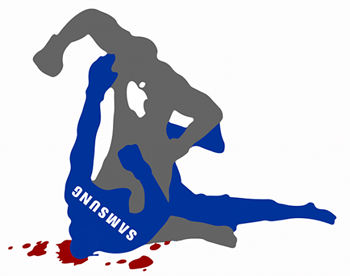 If granted, Apple would likely be able to enforce a US sales ban of Samsung's Galaxy S3. Samsung has asked the court to review the damages awarded, and if that happens, Apple wants $155.8 million to cover five infringing Samsung devices that the jury awarded below the minimum amount calculated by Samsung's damages expert. "It is unfortunate that patent law can be manipulated to give one company a monopoly over rectangles with rounded corners, or technology that is being improved every day by Samsung and other companies," Samsung said. The Korean company has asked for a retrial with adequate time to prepare and fair treatment of all parties. "The Court's constraints on trial time, witnesses and exhibits were unprecedented for a patent case of this complexity and magnitude, and prevented Samsung from presenting a full and fair case in response to Apple's many claims," it said.